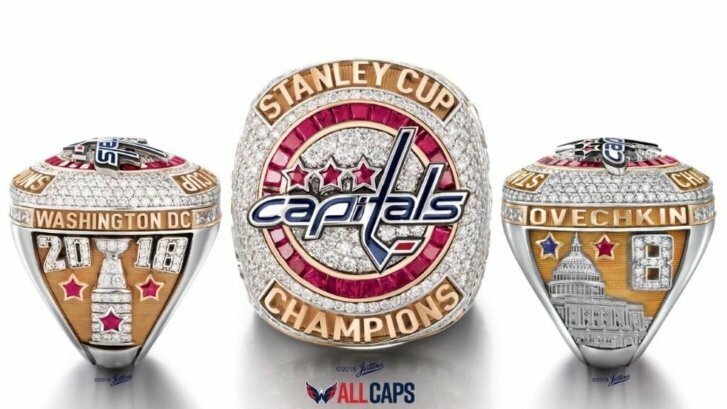 The Washington Capitals' 2018 Stanley Cup Championship rings were unveiled and presented to the team Monday during a private ceremony in D.C. See what they look like. WASHINGTON — The Washington Capitals’ 2018 Stanley Cup Championship rings were unveiled and presented to the team Monday during a private ceremony in D.C. The rings, created by custom jewelers Jostens, are made of 14-karat white and yellow gold with diamonds, rubies and blue sapphire. And there are a lot of gems on those rings. Each features 230 round diamonds, as well as 22 princess-cut diamonds, 35 rubies and a star-shaped sapphire. “We have always had one single, unwavering goal for the Washington Capitals: to build a team as great as our fan base,” said Caps owner Ted Leonsis in a news release. In addition to the rings, Jostens has a “fan collection” but be warned: the items there are pretty pricey. One fan will also have a chance to meet Leonsis if they win a CapsRing.org contest running from Oct. 3 to Jan. 3 — he’ll present the winner with their own Capitals Stanley Cup Championship ring. The winner also gets two tickets in the owner’s box to a Capitals game. A spokeswoman for the Capitals said they are asking for a minimum donation of $10 to enter the contest. All the proceeds will go to benefit The Monumental Sports & Entertainment Foundation that supports youth sports, education and fitness, military veterans and the homeless. See photos of the Caps’ 2018 Stanley Cup Championship rings below.